The Garfield Park Conservatory is one of my favorite places in Chicago. I have blogged about this in the past, taken many photos of the beautiful plant and flower displays, attended receptions there, saw an amazing Chihuly exhibit that took over the entire space, Niki in the Garden sculpture exhibit, and even learned how to raise urban chickens there. Last Thursday, we were at Millennium Park attending a concert, and cautiously watching a storm roll over the city. We left just before it hit, many areas of Chicago got golf ball sized hail. One unfortunate neighborhood was Garfield Park, where the 100-year-old Conservatory sits. 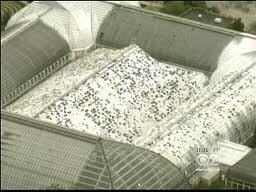 This is the largest Conservatory in the US. Jens Jensen designed parts of it. Watch this video. 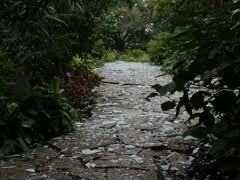 The destruction is heart breaking. 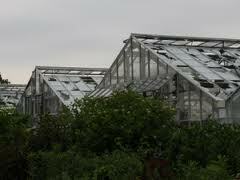 Over 1/2 the glass in most of the rooms and propagation houses was shattered. Donate here. Even more close-ups shown.